Designed in California by Posh Mommy! 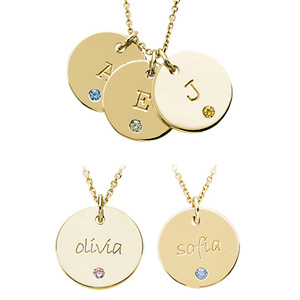 This polished, solid 14k yellow gold disc is 14mm in diameter [smaller than a dime] It features personalization for 1 name and a corresponding simulated birthstone. Each birth stone is 2.0 mm in diameter and gypsy set. Engrave up to 9 characters. Chain not included. We recommend a 1.0mm diamond cut cable chain.